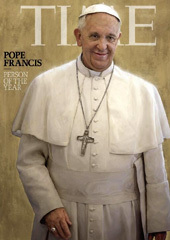 Pope Francis is Time’s Person of the Year for 2013. How many other non-Americans have been honored? Pope Francis I, Time Magazine's 2013 "Person of the Year"
Time Magazine announced that Pope Francis I, who was elected in March to succeed Pope Benedict XVI, is its “Person of the Year” for 2013. This is the 87th year that the American magazine has honored a person — or, in some years, a group or a thing — as the year’s biggest newsmaker. Time’s year-end issue typically honors an individual as its “Person of the Year,” identifying one person who can reasonably be said to be the year’s biggest newsmaker. In 1982 and again in 1988, it departed quite radically from this convention. 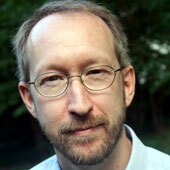 In 1982, it chose “the computer” as its “Machine of the Year.” This was the time of the Commodore 64, the Apple II and MS-DOS. Windows and the Mac were still a few years away, and personal computers had not yet become a fixture in every home and office, but the transition had begun. Time’s first three honorees were Americans: explorer Charles Lindbergh in 1927, businessman Walter Chrysler in 1928, and Owen D. Young, a diplomat who worked to reduce the burden of Germany’s war reparations, in 1929. Mahatma Gandhi was the first non-American honored as Time’s “Person of the Year.” In 1930, as a leader of India’s independence movement, Gandhi led the 240-mile Salt March — his nonviolent protest against British taxation and monopoly of salt production in colonial India. The first woman honored was China’s Soong May-ling, better known in the West as Madame Chiang. She and her husband, Nationalist Party leader Chiang Kai-shek, were selected in 1937 as the magazine’s “Man and Wife of the Year,” at the outset of war between China and Japan. The other women to be honored as individuals include American Wallis Simpson, whose relationship with King Edward VIII led to his abdication of the British crown, in 1936. Queen Elizabeth II was honored in 1952, the year of her accession to the throne. Corazon Aquino of the Philippines was selected in 1986, after becoming the first female president of an Asian nation. American women were honored as a group in 1975, in recognition of the successes of the feminist movement in the United States. On 13 different occasions, Time has used the honor to recognize a whole movement or group of people. The first time it did this was in 1950, when it named “the American solider” — who had just begun fighting in Korea earlier that summer — as the “Men of the Year.” Time honored American troops again in 2003, following the U.S. invasion of Iraq. Fourteen individuals — including nine U.S. presidents — have been selected more than once as “Person of the Year.” The first multi-year honoree was President Franklin D. Roosevelt, selected the year of his first presidential victory, 1932, and in 1934. Roosevelt — the only three-time honoree in the history of magazine — was chosen again in 1941, shortly after the Japanese attack at Pearl Harbor. Harry S. Truman, Dwight D. Eisenhower (who was honored first as a general and later as a president), Lyndon B. Johnson, Richard Nixon, Ronald Reagan (who shared honors in 1982 with Soviet Premier Yuri Andropov), Bill Clinton, George W. Bush and Barack Obama complete the list of U.S. presidents honored more than once. George Marshall is the only other American to be chosen “Person of the Year” by Time more than once. He was recognized in 1943 for his leadership of Allied troops in Europe during World War II, and again in 1947 as architect of European reconstruction (the “Marshall Plan”). The non-American multi-year honorees are China’s Deng Xiaoping, USSR’s Joseph Stalin and Mikhail Gorbachev, and Britain’s Winston Churchill. From Gandhi (1930) to Pope Francis I (2013), nearly half of the individuals who have been named Time’s “Person of the Year” have been non-Americans. Not surprisingly, the list is heavy with America’s friends and foes during World War II and the Cold War years — Churchill, Stalin, Adolf Hitler, Charles de Gaulle, Nikita Khrushchev, West Germany’s Konrad Adenauer and Willy Brandt, and Mikhail Gorbachev. Before Pope Francis, the most recent non-American “Person of the Year” was Vladimir Putin, who in 2007 was nearing the end of his first tenure as president of Russia. Since the selection of Ayatollah Khomeini in 1979 — the year in which demonstrations drove the Shah into exile and protesters overran the U.S. embassy in Tehran, taking 52 Americans hostage — the selection of non-Americans, especially those hostile to the United States, has been rare. For example, after the attacks on the World Trade Center and the Pentagon in 2001, Time chose then-New York City Mayor Rudolph Giuliani as “Person of the Year” over the architect of the attacks, Osama bin Laden. Facebook founder Mark Zuckerberg was selected in 2010 when he was 26, making him the second-youngest “Person of the Year.” (Charles Lindbergh, the very first selection in 1927, was just 25.) Scientist David Ho was honored in 1996 for his advances in AIDS research. Businessman Ted Turner received the honor in 1991, after the 24-hour news network he founded had provided round-the-clock coverage of the mass demonstrations in Beijing’s Tiananmen Square in 1989 and the fall of the Berlin Wall in 1990. Nixon to China, Bush to Kyoto?